New Britain, Conn. - The Somerset Patriots (1-2, 43-30) dropped the final game of their road trip 5-4 to the New Britain Bees (2-1, 28-43) Wednesday evening at New Britain Stadium. New Britain took an early 3-0 lead in the first inning on Jovan Rosa’s (9) three-run home run to left field. Somerset responded on a Kyle Roller sacrifice fly in the fourth to trim the difference to two before James Skelton drew a bases-loaded walk the next half-inning, extending the lead back out to three. The Patriots later rallied to tie the game at 4-4 in the seventh inning. 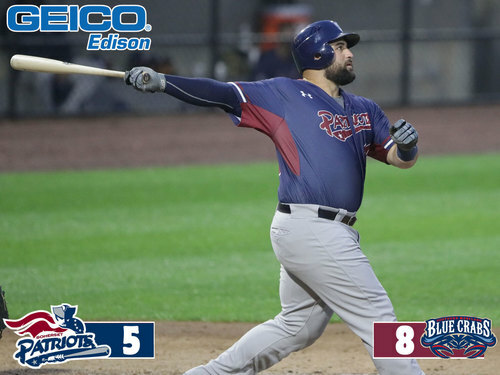 A Yovan Gonzalez RBI single, followed by sacrifice flies from Justin Pacchioli and Scott Kelly brought Somerset even with New Britain. The Bees won the ballgame in the bottom of the ninth on a run-scoring error on a ground ball hit back to the pitcher. Patriots’ starting pitcher Will Oliver tossed a season-high seven innings and tied a Patriots’ single-game high with nine strikeouts. Shawn Gilblair (1-2) earned the win with a scoreless inning of relief. Kyler Newby (2-4) took the loss, yielding a run over one-third of an inning. Neither starting pitcher factored into the decision. The Patriots have Thursday off before beginning a three-game series against the Sugar Land Skeeters Friday night. First pitch at TD Bank Ballpark is scheduled for 7:05 p.m.